Abstract: Increasing intelligence is an emerging trend in inland shipping. Ship intelligence is an important part in this. The study of the autonomous operation of inland ships can be beneficial for improving operational efficiency and enhancing waterway management. 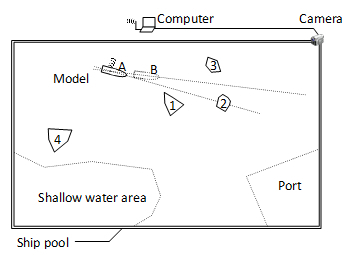 This paper focuses on autonomous operational control for inland barges. In particular, a proposal for an experimental platform for autonomous operational control of inland ships is proposed. An overview is provided of the hardware components of the platform, the software architecture built on top of this hardware, and a model for ship motion control built inside this software. The development of this platform is expected to provide a basis for experimenting with ship automatic port approaching and departure methods, ship to shore information sharing techniques, and multi-ship cooperative navigation approaches. Reference: C. Liu, R.R. Negenborn, F. Ma, X. Chu, H. Zheng. Towards an Experimental Platform for Inland Waterway Ship Navigation. In Proceedings of the 2014 IEEE International Conference on Networking, Sensing, and Control (ICNSC 2014), Miami, Florida, pp. 707-712, April 2014.